Ran the fastest BC Juvenile (1:41.91) in the last 8 years! 2nd by a very narrow margin in the voting for Eclipse Champion 2 yo. Earned a 104 beyer as a 2yo and a 105 beyer as a 3yo. Ran a career best Ragozin number of 4-3/4 as a 2 yo. BRILLIANT 6-1/2 length winner of the $2M G1 Breeder’s Cup Juvenile on dirt! (104 beyer) Beat Carpe Diem, Upstart, Daredevil, etc. “In figure terms, this is the strongest 2yo field EVER assembled” – Thoro-Graph, prior to the running of 2014 BC Juvenile. 3rd to American Pharoah and Calculator in the $300k G1 Front Runner at Santa Anita. 2nd by a neck to sprinter Lord Nelson at 7 furlongs in the $200k G2 San Vicente S.
2nd in $500k G3 Dwyer S. to talented 3yo Speightster. Texas Red is by Afleet Alex, G1-winning 2yo, and dual Classic Winner at 3 ($2,765,800). 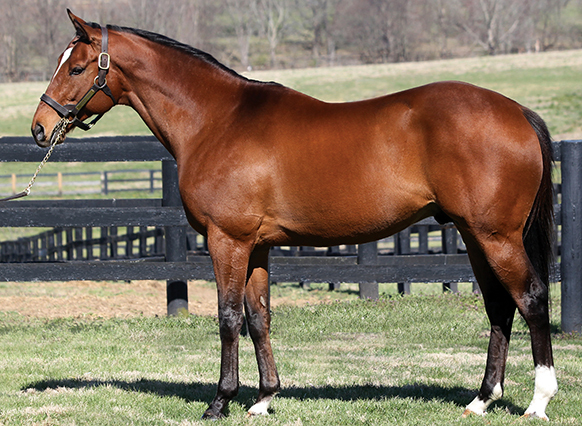 Afleet Alex is a consistent sire of Stakes Winners. He has sired 7 individual G1-winners, and in 2015 he sired three G1-winning 3yos in Texas Red, Materiality and Sharla Rae. Texas Red was bred in Kentucky by Stonestreet Thoroughbred Holdings LLC and is out of the GSP/SW dam Ramatuelle (CHI). His pedigree is free of Storm Cat, A.P. Indy, and Seattle Slew! TEXAS RED SIRES FIRST TWO FOALS! Texas Red, a G1-Breeders’ Cup Juvenile winner and millionaire, has sired his first two foals born on January 22nd and 23rd respectively. The first was a colt foaled in New York for Sandee Schultz. He is out of Betty’s Baroness (Smarty Jones), who is a half-sister to multiple G1-winning millionaire, Excellent Meeting ($1,402,396), as well as black-type stakes winners, Crowning Meeting ($514,732) and Crown of Crimson ($161,426). “He’s a big foal, stood up right away, very nice legs on this colt. I’m very pleased!” said Schultz. The second was a filly foaled in Iowa for Jeff Hartz. She is out of Crystal Lake Drive (Giant’s Causeway), who is a half-sister to black-type stakes placed, Fleet Dude ($81,875). Crystal Lake Drive is out of a half-sister to Champion 3yo and successful sire, Afleet Alex ($2,765,800); coincidentally also the sire of Texas Red. She is also a half-sister to G2-placed Stakes winner, Unforgettable Max ($384,079), black-type stakes placed, Stormin Maggy, and also to Curlin Hawk, the dam of recent G3 Pilgrim winner, Seabhac. “I’m very happy with the result of this mating. This is a big healthy filly, a lot of substance to her; lots of leg and bone and very strong.” said Hartz. Texas Red was a brilliant two year old and won the $2,000,000 G1 Breeder’s Cup Juvenile by 6-1/2 lengths. He earned a 104 beyer and also ran the fastest Breeders’ Cup Juvenile in the last 9 years. He was ranked co-#1 on the 2014 Experimental Free Handicap; tied with American Pharoah and was second by a very narrow margin in the voting for Eclipse Champion two year old. As a three year old, Texas Red won the $600,000 G2 Jim Dandy at Saratoga, defeating Frosted. He retired to Crestwood in 2017 with earnings of $1,767,300 and bred a quality first book of mares that consisted of 49% Black-type runners and/or Producers. TEXAS RED TO STAND AT CRESTWOOD FARM! Texas Red, winner of the G1 Breeders’ Cup Juvenile in 2014, will enter stud at Pope McLean’s Crestwood Farm in Kentucky for the 2017 season. Trained and co-owned by Keith Desormeaux in partnership with Erich Brehm, Wayne Detmar, Gene Voss and Lee Michaels; Texas Red showed early promise in a Maiden Special Weight win at Del Mar, and in coming back to run 3rd in the G1 Frontrunner Stakes to American Pharoah and Calculator. Texas Red’s two year old campaign was capped off with a brilliant 6-1/2 length G1 Breeders’ Cup Juvenile win in 1:41.91 which happens to be the fastest running of the race in the last eight years. He earned a 104 beyer speed figure for that effort. Despite narrowly being outvoted for Champion two year old, he started his three year old year sharing the #1 spot on the Experimental Free Handicap with American Pharoah. After opening his 3-year-old campaign with a runner-up finish in the G2 San Vicente Stakes to now MGISW sprinter Lord Nelson, the son of Afleet Alex was knocked off the Triple Crown trail with a foot abscess but returned later that year to capture the G2 Jim Dandy Stakes at Saratoga over MGISW Frosted earning a 105 beyer. Bred by Stonestreet Thoroughbred Holdings, Texas Red retires with three wins, three seconds and one third from nine starts and $1,767,300 in earnings. Texas Red is by dual Classic Winner Afleet Alex, a consistent sire of Graded Stakes Winners. He is out of the mare, Ramatuelle, a successful Stakes winner in Chile before being sent to the United States, where she placed in the 2005 G3 Desert Stormer Handicap. Keith Desormeaux, Erich Brehm, Wayne Detmar, Gene Voss and Lee Michaels will retain a majority interest in Texas Red, and will stand him in partnership with Crestwood Farm. He will stand for a fee of $7,500 LFSN. Please call the farm for more information. (8.5f, D, defeating Carpe Diem, Upstart, The Great War, Mr. Z, One Lucky Dane, Souper Colossal, Lucky Player, Private Prospect, Blue Dancer, Daredevil). (8f, AW, defeating Secreto Primero, Battle of Evermore, Harmonic, Pioneerof the West, Increase, Naval Cadet, Spin Forty, Congrats Seattle, Tizunanimous). (8.5f, D, to American Pharoah, Calculator, defeating Lord Nelson, Daddy D T, Skyway, Conquest Panthera, Sky Preacher). (9f, D, defeating Frosted, Japan, Frammento). (7f, D, to Lord Nelson, defeating Sir Samson, Bench Warrant, Jazzy Josh, Serbian Syclone). (8f, D, to Speightster, defeating Tommy Macho, Smart Transition, Blofeld, Hollywood Angel, Bridget's Big Luvy).